This is the Champs Fleuri, where refugees had set up camp in the days before the bombings of June 15 and 16, 1940. Witnesses say there had been some French soliders there as well, and that they were the plane's likely targets. After the bombings, many Fértesians decided to leave town and join the mass exodus to the south. According to an armistice signed on June 22, 1940 France was divided into two zones. The occupied zone, of which La Ferté was a part, represented two-thirds of the country. The Cher River separated made a natural barrier, but the city of Vierzon (45 minutes from here) was separated into two parts, one occupied and one a part of the French Vichy government. Although one part was occupied and one wasn't, no one was really free. On June 18, the German troops began arriving in La Ferté and setting themselves up in abaondoned houses, at the castle or at local hotels. Shortly after midnight on the 18th, a young witness says the first Germans arrived at his house. Their helmets touched the top of the door. They asked him where his father was, and he told them, "He's a soldier. No news." The soldier replied, "The war, bad news. He'll return soon." The witness said the following days were a grand party. They played piano and sang at the top of their lungs, drinking the wine of their unwilling hosts. Curfews were installed. No one was allowed out between 10 p.m. and 6 a.m. without written authorization. German patrols were out all the time. In March of 1944, Fertésian Raymond Langlois was the canton's first civil victim. He was shot in nearby Bardon for not respecting the curfew. 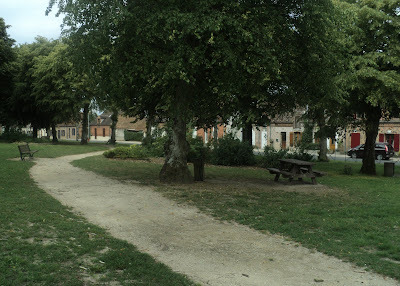 For more on La Ferté Saint Aubin's historical society, click here.